Vetalogica have shown to be one of the better Australian brands. They formulate their foods with one important consideration in mind – dogs are essentially carnivores. That’s against the grain (sorry for the pun) of most “popular” and “scientific” pet foods which seem to be designed more for herbivores or corn-munchers. 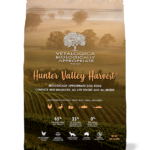 For this review we’ll take a look at the Hunter Valley Harvest formula, but the other two formulas and puppy formula are pretty much equal. The food boasts 38% protein which is great, especially as most of it comes from meat. That’s almost double the protein of most supermarket brands (which tend to be grain proteins). It’s nice to see the amount of carbs sit relatively low at 34% (estimated), but I find the 10% fat slightly on the low side. 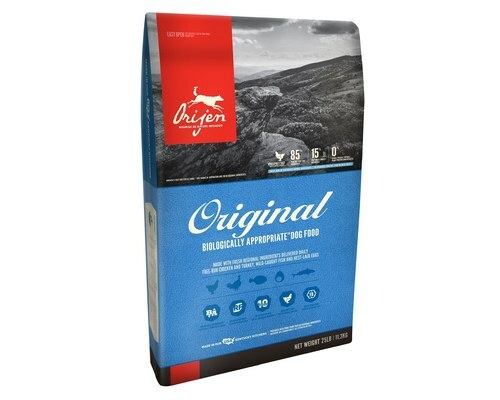 Meat should always be the most significant ingredient in a dog food. In this food the first FOUR are meat – chicken, duck, tuna, and mackerel. They’re all decent ingredients in their own right, and it’s nice to see a mixture. They claim on the packaging meat and fish ingredients amount to 65% of the product (inclusive of chicken fat further down the ingredients list) – that’s good. The next chunk of ingredients is a combination of sweet potato, chickpeas, green and red lentils. These will amount to most of the remaining 35%. None are bad choices, and again it’s nice to see a mixture of ingredients instead of just meat and rice or meat and potatoes. It shows consideration, and provides a more rounded nutrient base. Even the ingredients lower down the list show how well considered the food is. It’s nice to see the inclusion of eggs, flaxseed, quality fruits and vegetables, and coconut oil. It’s clear they haven’t skimped on any ingredients with cheaper substitutes. The food has no grains, no nasty fillers, no chemical antioxidants or preservatives, and no pointless food colourings. It’s a really good well-rounded food.